The real-life examples will be helpful for students. Mark A. Gluck is a Professor of Neuroscience at Rutgers University–Newark, co-director of the Memory Disorders Project at Rutgers–Newark, and publisher of the project’s public health newsletter, Memory Loss and the Brain. His research focuses on the neural bases of learning and memory, and the consequences of memory loss due to aging, trauma, and disease. He is co-author of Gateway to Memory: An Introduction to Neural Network Modeling of the Hippocampus and Learning (MIT Press, 2001). In 1996, he was awarded an NSF Presidential Early Career Award for Scientists and Engineers by President Bill Clinton. That same year, he received the American Psychological Association (APA) Distinguish Scientific Award for Early Career Contribution to Psychology. 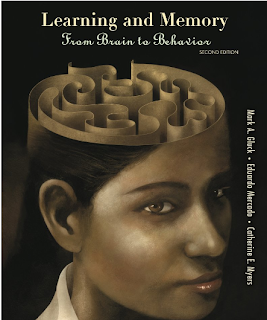 Catherine E. Myers is a Research Professor of Psychology at Rutgers University–Newark, co-director of the Memory Disorders Project at Rutgers–Newark, and Editor-in-Chief of the project’s public health newsletter, Memory Loss and the Brain. Her research includes both computational neuroscience and experimental psychology, and focuses on human memory, specifically on memory impairments following damage to the hippocampus and associated brain structures. She is co-author of Gateway to Memory: An Introduction to Neural Network Modeling of the Hippocampus and Learning (MIT Press, 2001) and author of Delay Learning in Artificial Neural Networks (Chapman and Hall, 1992). Intelligent Adaptive Learning™ Pre-K to Grade 5 Math aligned to the Common Core empowers students to master key concepts and increase achievement. DreamBox pairs a CCSS-based math curriculum with an Intelligent Adaptive Learning Engine™ that adjusts to the needs of all students. 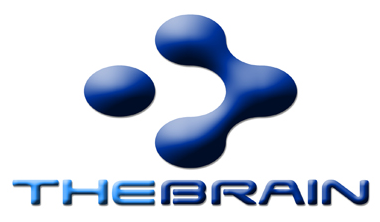 The DreamBox Difference – Intelligent Adaptive Learning from DreamBox Learning on Vimeo. LEARNING HISTORY is coming to you on the 22nd May! Do you want to be part of it? Zaid Ali Alsagoff is the e-Learning Manager and Fellow of IMU Centre for Education. He has more than ten years’ hands-on experience with implementing e-learning in higher education. He has done research in several key e-learning areas, including social media, web 2.0, open educational resources (OER), educational gaming, role-play simulation, virtual classrooms, learning (content) management systems, e-learning standards, instructional design and courseware development. He has also been a practitioner and promoter of Open Educational Resources (OER) since 2005. According to one survey, he was ranked among the ‘Top Ten’ most influential people (2012) in the corporate e-learning sector in the Asia-Pacific. He is most known worldwide among learning professionals and educators for his learning adventure (blog) known as ‘ZaidLearn’. 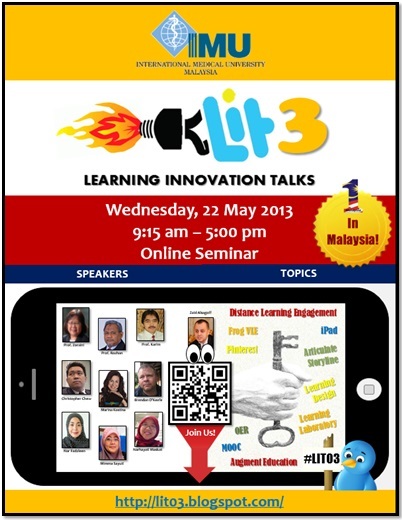 Join us for this really exciting upcoming Learning Innovation Talks 3 (LIT 03) organized by IMU, which will be done FULLY ONLINE. 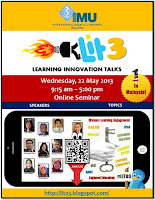 FIRST 1-Day Online Seminar held by a University in Malaysia. Opportunity to connect and engage with AWESOME EDUCATORS. 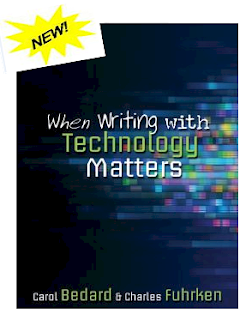 Learn SIZZLING NEW TRICKS and tips on how to use technology to transform learning. 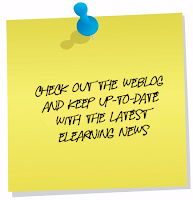 Exposure to the LATEST TRENDS in e-learning. Will Get a DIGITAL CERTIFICATE OF ATTENDANCE if you register and attend. Oops, I forgot to mention that this online seminar is FREE! What are you waiting for? Articles released by the Australasian Journal of Educational Technology. Just look at these interesting articles, appears in the Australasian Journal of Educational Technology (AJET), Volume 29, Number 1, 2013. "This issue contains a range of articles addressing some of the most important contemporary issues in educational technology research, including technology supported learning design in higher education, teacher knowledge and ICT capacity development, the use of laptops and mobile devices in schools, and comparisons of learning outcomes achieved with and without technology". This study identified critical issues in the design of a blended learning environment by examining basic design considerations and implementation issues. Following a design-based research approach with the phenomenological tradition of qualitative research, the study investigated instructor experiences relating to the design, development, and implementation processes of a blended course. The results reveal that the design considerations centred on the pedagogical approach, course organization, materials preparation, interactions, and the instructor's and students' roles. The affordances of the implementation included the arousal of the students' interest and participation, flexibility, time conservation, the ability to track student progress, and the improvement of interaction, collaboration, and communication opportunities. The challenges were increased workload, course and time management, overlaps, and the creation of harmony between the face-to-face and online environments. The overall results show that the critical issues involved context, the pedagogical framework, instructor competency, and technical issues in the blended course design. This paper reports on the adoption of mobile handheld technologies in ten Western Australian independent schools, based on interviews with staff conducted in 2011. iPads were the most popular device, followed by iPod Touches and iPhones. Class sets were common at lower levels, with 1:1 models becoming increasingly common at higher levels. Mobile learning, or m-learning, was still at an experimental stage in most schools, but common themes were already emerging around the need to integrate mobile devices into a broader learning ecology. Key discussions focused on their role in promoting consumption or production, collaboration or personalisation, and creating seamless learning spaces. Used for both organisational and pedagogical purposes, mobile devices were seen as enhancing student motivation, with empirical evidence of improved student learning also emerging in small-scale studies conducted by two schools. Challenges included the need to carefully manage the technology, ethical issues in its use, and staff roles in its deployment. Pedagogically grounded and adequately contextualised professional development (PD) was seen as vital for time-poor staff, while a desire to set up a professional community of practice was widely expressed. All the schools surveyed planned to extend their use of mobile handheld technologies in the future. Visit the website to review articles and items of interest. 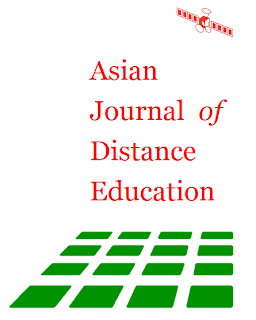 Articles released by the Asian Journal of Distance Education. 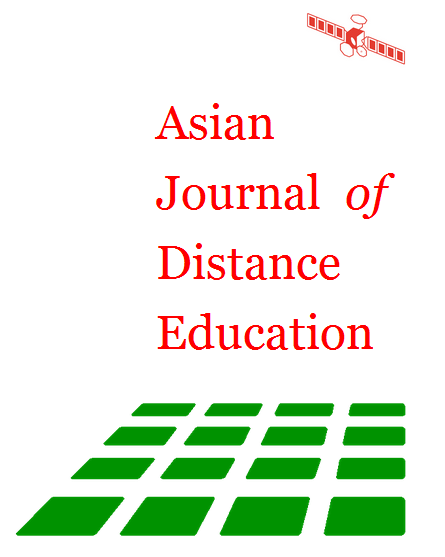 Take a look at these interesting articles, appears in the Asian Journal of Distance Education. KAWACHI & SHARMA writes,"In this Issue we present a group of papers describing how face-to-face teaching is now used in open and distance educaton. The phenomenon of not lettinggo of thiselement has several reasons for its continued role in distance education. Someof these reasons are to do with teaching andassessment, and one other may be related tothe need forstudent online socia presence". This article discusses relationship between five sub-variables (tutorial preparation, masteryof subject, teaching ability, communication ability, and tutor’s discipline) in tutor performancevariable, tutorial result variable, tutorial cost variable and students’ satisfaction variable in face-to-face tutorial at Universitas Terbuka, Indonesia. Totally, there are seven independent variables and one dependent variable. Three sub-variables (mastery of subject. teaching ability, communication ability) in tutor performance are interacted. 200 respondents as a sample werecollected by purposive sampling. To analyze the data, factorial analysis, correlation, andregression were used. The result showed that there are significant and positive correlationbetween sub-variables in tutor’s performance (tutorial preparation, mastery of subject, teachingability, communication ability, and tutor’s discipline), tutorial result, tutorial cost and customer satisfaction. In addition coefficients regression between some sub-variables and their interaction in tutor performance, tutorial result, and student’s satisfaction are also significant. This Paper reportsthe distance education practices in Turkey, and then examinesand discusses the role of leadership which should be undertaken by Turkey in the regions of Eastern Europe, Scandinavia, Baltic, Turkic, Caucasian, theMiddle East and northern Africa. International distance education organizations in the world are not well organized and functional in this area, nor arethe regional distance education institutions in the name ofeducational institutionalism. To fill this gap, it is argued here that Turkey take a leadership role in the distance education field in this region and there by organize the practices of the regional countries for their mutual co-prosperity and benefits. 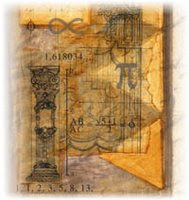 The structure of the potential distance education organization and the regulations of the organization is discussed in more detail based on this argument and available freely online at http://www.midasebook.com. The suggestedname for this regional group is ICDEEEWA (International Council for Distance Education forEastern Europe and West Asia). A draft of the constitution of the recommended association is presented and discussed at http://www.midasebook.com. Attend this webinar to learn to Speak up! The first few moments of any presentation are when your audience decides whether they are going to listen to you or not. You must be authentic, confident and compelling if you want them to find you – and your presentation – credible. 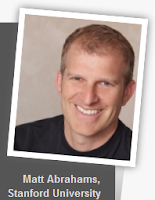 Join Matt Abrahams, educator and coach at Stanford University, as he draws upon scholarly research to analyse credibility and reveal just what it takes to be taken seriously when presenting. Laura Devaney, Managing Editor writes, "Today, we feature an updated "best apps" story for 2013. 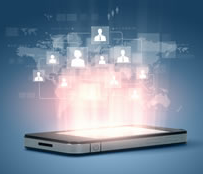 Our list includes apps we thought students and teachers might find useful". Last year we presented “New: 10 of the best Apple apps for education in 2012,” which highlighted some of the best apps for iPhones and iPods. However, with new upgrades in touch technology, and the emphasis on Common Core State Standards and school reform in general, we’ve come up with a new list of the best Apple- and Android-based education apps for 2013.
eSchool News writes today: "Many aspiring crafters and cooking fanatics are familiar with Pinterest, a social media site set up like a virtual bulletin board in which users “pin” favorite home décor, cooking, and craft ideas". 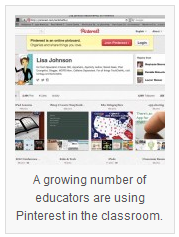 But now education is hopping on the Pinterest bandwagon, as teachers and administrators are quickly discovering that the site is replete with resources for students of all ages and abilities. Users may sign up for a Pinterest account using an eMail address, and create boards for different topics. 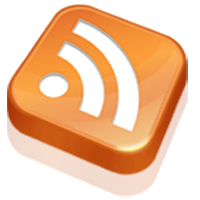 They can search for specific ideas, or “pins,” or browse through popular pins and filter by subject. Pinterest is public, and users can follow other pinners much like they would on Twitter.